How do I send a release to the Newswire? 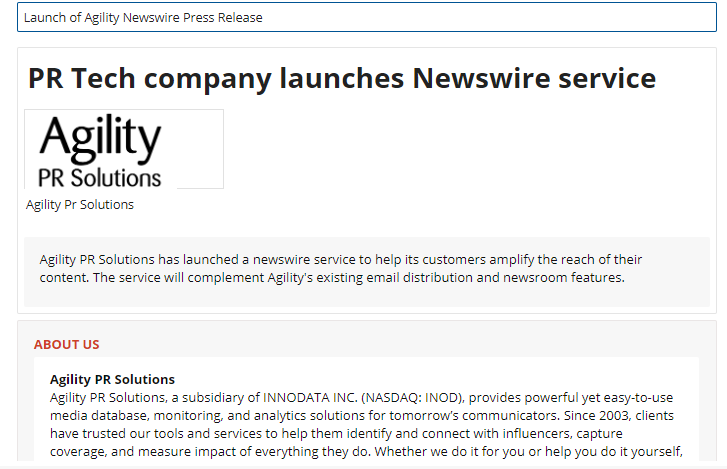 One of Agility's newest features enables you to amplify your press release distribution by using our newswire service. We can distribute over a wide variety of global circuits, depending on your requirements. If you are looking to reach the US and/or the UK, you can use the Agility platform to submit your order. If you need to distribute outside the US and UK, please send your release to agilitysupport@agilitypr.com for us to handle on your behalf. 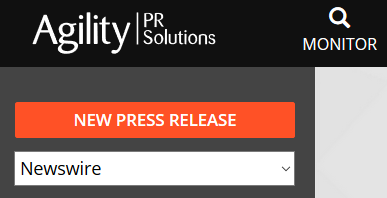 Create a new order by clicking on 'New Press Release'. Create a new press release or select from your existing content (previous email distributions, newsroom stories or wire releases). Name your Press Release: This is an internal name to help you identify the task later. Headline: Type or paste your press release headline here. UK wires must have a headline no longer than 50 characters. US wires must have a headline no longer than 300 characters. Company name: The organisation that is the source for the release or that the release is about . Body: The main body of the release. Paste the main body of your content directly into this field. Images and tables cannot be included in the body. 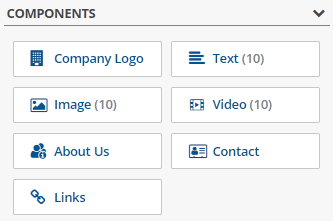 Images and a company logo can be attached in their specific fields. Images, Videos and Company logo: Up to ten images can be added to your release PLUS one company logo, which can be added in its own field on the right hand side. You can also embed up to ten video links in your story using the video field. Note: You cannot attach or upload a video in Agility. Videos are embedded by including a link to the site that they are hosted on (e.g. YouTube). Contact, About Us and Links can be completed, or the information can also be kept in the body field. Additional text blocks can be used to keep content separate from the main body. Up to 10 of these can be added. Distribution region:The number and type of distributions available are shown alongside the editor. You should select which distribution you would like, US or UK. If you wish to reach a territory outside the US and UK, please email the order to agilitysupport@agilitypr.com. Scheduling: In selecting a time for distribution, you must allow 75 minutes for the wire team to review it and publish it. If you want ASAP distribution, or to place a release On Hold for Call, select a time at least 75 minutes from now and use the Notes to Editor field to specify the requirements to our editorial team. Additional Information: Select an industry to apply to this list, which will help with targeting. You can also provide a metadata description – a summary of the release which will show up on search engine results pages. The character limit for this is 200 characters. Contact Information:This is for our editorial team to contact you if they wish to query or check any details of the order. The information given here can be different to the media contact given in the release content. It will not be made public. Notes to editor:The editor referred to is our copy editor – these notes will not be made public. Place any relevant instruction or request here, such as a request for ASAP distribution, or to place a release On Hold for Call. When you are satisfied with your release, select ‘Save as Draft’ and then ‘Submit for Review’ when you’re ready to send to our editorial team. A summary of the order is provided, and to continue you must accept two sets of terms. Once you have submitted a release, you will be able to preview it. You will also receive an order confirmation by email. 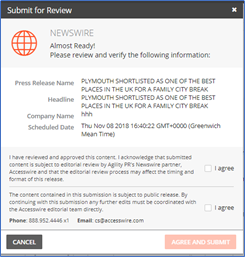 To make updates to releases or to retract a release going out within 60 minutes, contact the editorial team directly on (001)-888-952-4446 x1 or cs@accesswire.com. Once a release has been distributed, reporting statistics will be made available within the Agility platform. 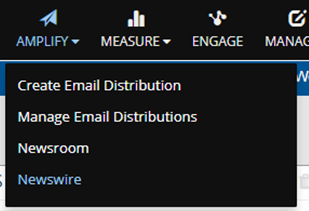 Each submitted task will show the button 'View Statistics'. leading you to your specific order. Any questions will be welcome at agilitysupport@agilitypr.com. Please note: Before submitting a press release for wire distribution, you will need to purchase a wire package, or single wire from your Agility PR Solutions Account Manager. If you aren't sure who that is, visit www.agilitypr.com/newswire-order for contact details or to fill in a form to request follow up.